For short runs, full color printing, and many other applications, a large inkjet system isn't always the most cost effective solution. That is why Addresser Based Systems offers a full line of digital presses, envelope, and post card laser printers and table-top inkjet envelope address printers. 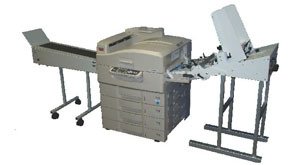 By offering the latest technology, we can offer mailing equipment solutions to fit the needs of your clients. We work with you to find a solution that will give your clients the choices they need, whether it's full color variable data prints or short run barcode prints on envelopes, postcards, or any other stock. Take a look through our full line of equipment, browse through our used mail equipment section, or call or email us and find out what we can offer you.